Yarn Nook: Name that Sheep! I'm sure many of you have noticed the cute little addition to the shop pictured here. You have seen our sheep hanging around in different locations in the shop and in our shop photos on the blog. We have yet to come up with a suitable name for our sheep and decided to ask you all for help. 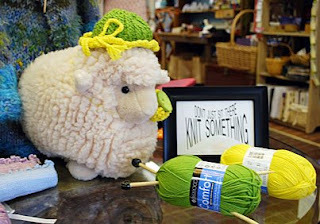 So, Yarn Nook is pleased to announce its name that sheep contest. If you have an idea for a great name for our new friend, please click on the link below to email us your suggestion. We will collect the submissions during the next two weeks and will announce the winner on the blog on May 7th! As a token of our appreciation, the winner of the name our sheep contest will receive a skein of Happy sock yarn by Wendy. Happy comes in lots of great colors, is 75% Bamboo and 25% Nylon, and each skein contains enough yardage to knit a pair of socks.